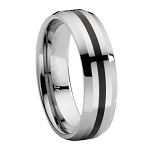 There is just something so special about the appearance and style of men’s black rings. Not every man chooses to wear this style, but those that do are typically bold and sophisticated. 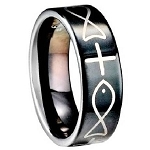 We have an incredible selection of black rings that includes inserts, inlays, and black enamel. 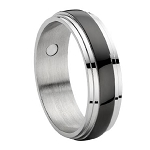 Made from the best materials like stainless steel, titanium, and even tungsten-carbide. We invite you to discover all of our beautiful choices! We have many different men’s black rings that come in many creative designs, and combinations that make them look incredible. Whether you’re looking for one with a cross on it to show your faith, or a polished finish to shine like no other, we have everything you’re looking for. All men value comfort, especially with rings. Wearing a ring every day is simply not something most men are used to, so it’s important to find one that is comfortable. Our selection is full of quality choices that look and feel great, and there is something for every type of man right here. Many of our choices provide a classic look with an addition of a beautiful design, a combination of metals, or something that makes it unique. Not only does it look great, all of our rings are known to be durable, and very affordable. 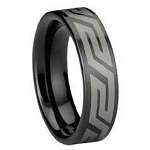 If you’re looking for something to stand out, men’s black rings are always a great choice. Our designs feature many classic looks that are stunning, as well as some newer choices with a modern twist. No matter what style you typically prefer, you can find a great choice from our collection. 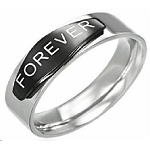 You can feel comfortable wearing our men’s black rings on a daily basis, no matter what you’re doing. They’re made with the best materials that look great and last a lifetime. With tons of edgy designs that are meant to be shown off, you can find one that is perfect, all for the best value!